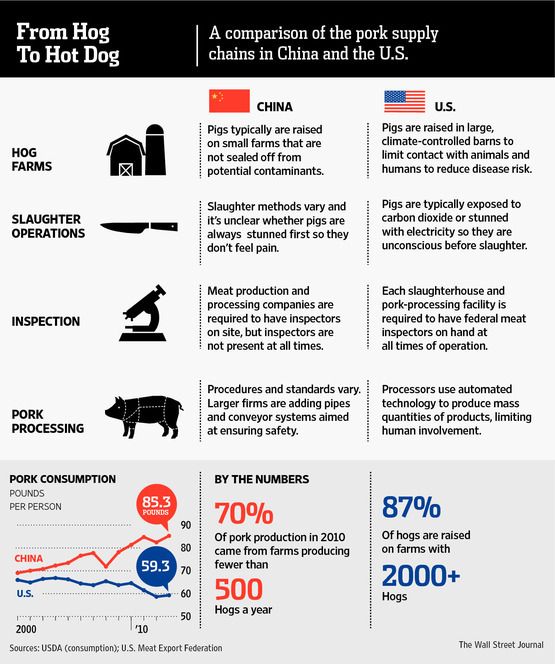 As the Chinese population and economy continue to grow, safer and more efficient industrialization practices are necessary to keep up with the demands of a hot dog hungry China. This is not an exaggeration as China is “the world’s largest consumer of pork.” A recent takeover of Smithfield Foods by Shuanghui Holdings Ltd., “China’s biggest meat processor,” will provide valuable insight into industry practices that are commonplace in the U.S. Current processing methods in China lack quality control as the majority of meat is produced by small farms that process less than 500 hogs per year. Although the trend in U.S. agriculture is to go “back to the start” as expressed in marketing campaigns by environmentally conscious companies like Chipotle Mexican Grill, this is not the reality in China. As health out-breaks are more widespread in this Asian country and regulation lacking, efforts to “control food safety” and create more modernized processing methods are a welcomed site. In such an industry, operational expertise will prove essential in restructuring the pork processing system in China. They will likely face challenges like determining adequate process and capacity design for farming facilities and distribution channels; forecasting to meet the demands of a growing population; and improving inefficient and broken supply chains. Improved product quality will likely be most prominent and follow a manufacturing-based definition as increased standards will ensure a safer finished product. On a personal note, I am an advocate for more naturally produced food in smaller farming environments, yet I understand that the demands and current conditions in China are quite different from the U.S. All criticism aside, the majority of the U.S. population relies on the safe meat supply provided by corporations like Smithfield to ensure peace-of-mind at the dinner table. 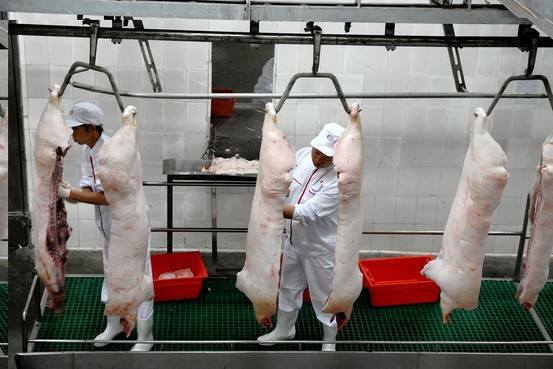 How do you think that the new deal between Shuanghi and Smithfield will impact Chinese and U.S. consumers, respectively. Will the Chinese citizens have a similar sentiment toward industrialized farming practices in future decades? Posted in 11-Supply-Chain Management, 2 Business Topics 1, 2 Business Topics 2, 2 Operations Strategy, 4 Forecasting, 5 Design of Goods and Services, 6 Managing Quality, 7s Capacity & Constraint Management, Course & Term, MGT301- Spring 2013Tagged capacity, China, forecasting, Industrialization, Meat Processing, quality control, Safety, Supply Chain management, U.S. Regardless of who makes them, hot dogs are notorious for being a low quality food. 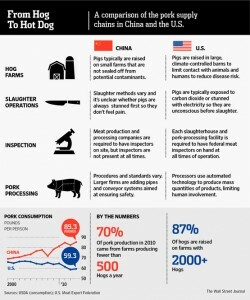 That being said, if pork from small farms is a breeding ground for diseases, I think this deal will only benefit the Chinese hot dog market. Hopefully Smithfield can gain a reputation for high quality hot dogs and a model for the rest of hot dog production in China. At the same time, I don’t think we’ll being seeing any improvements to hot dog regulations in China anytime soon. As someone who believes that the United States does not have enough regulations for the meat industry, I think it will be frightening to see another country recreate a meat conglomerate such as Smithfield. The working conditions within the meat industry has reverted back to being one of the most dangerous jobs, and for a country such as China that does not have laws that protect their workers like those of the United State’s, I think safety concerns will not just stop food contamination. With that being said, high food demand makes the stray away from factory farming unavoidable, but with new USDA regulations, I think the United States could set an excellent example for other countries to follow suit.